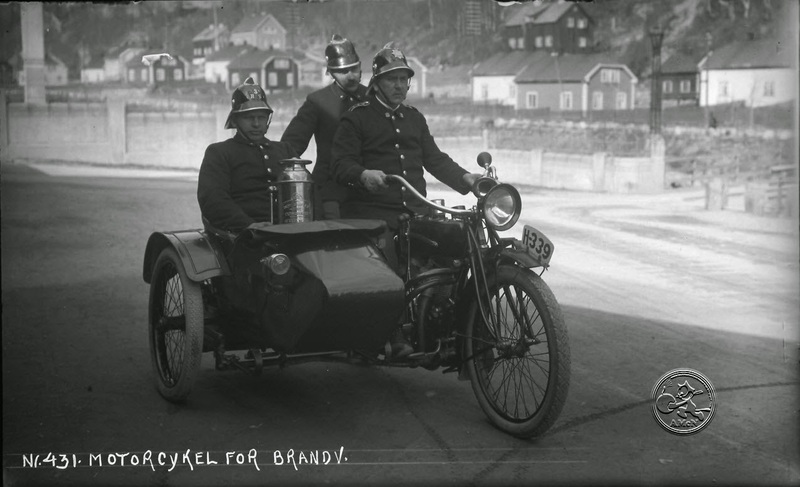 I have previously posted pictures on this blog, showing Rjukan`s motorized fire brigade and their Indian motocycles. Time goes by fast, quite a while ago I gave a hand with translating a text regarding this brigade, and the unknown destiny of the Indians once used by them. This text was authored by Andre whom we know as the owner of the "famous" Spanjola four, another bike previously presented on this blog. Andre wrote this article to the International Indian magazine, hence some might have seen it before. Finally I got time to get the article on this blog (with Andre`s permission off course), and what is great news i managed to get some great photos from Rjukan Industrial museums archives to follow the words by Andre, big thanks to them. Rjukan, a Norwegian community tucked in the bottom of a valley between high mountains in county of Telemark. Prior to 1906 “Rjukan” was just a rural area known for the nearby waterfall, the Rjukan falls. This would soon be changed. Sam Eyde, founder of Norsk Hydro and Norway’s most famous industrial pioneer, bought the land and the waterfall rights. By 1911 the tamed waterfalls would become power source to create synthetic nitrogen by the use of a huge electric arc, a method invented by Hydros co-founder and scientist Kristian Birkeland, the so called: Eyde-Birkeland method. The synthetic nitrogen was used in Norsk Hydro’s new plant as part of their process to fabricate Norges saltpeter, a fertilizer product which in turn would modernize agriculture worldwide. When Sam Eyde and Hydro’s generator plant and factory where ready to start producing, the total cost was by then Norway’s largest single investment. To ensure their investments Hydro built a new and modern fire station inside the factory and a new brigade was organized. In 1919 the fire station invested in two Indian 1000cc Powerplus sidecar outfits to be able to reach a fire in less time than by the earlier non-motorized brigade. 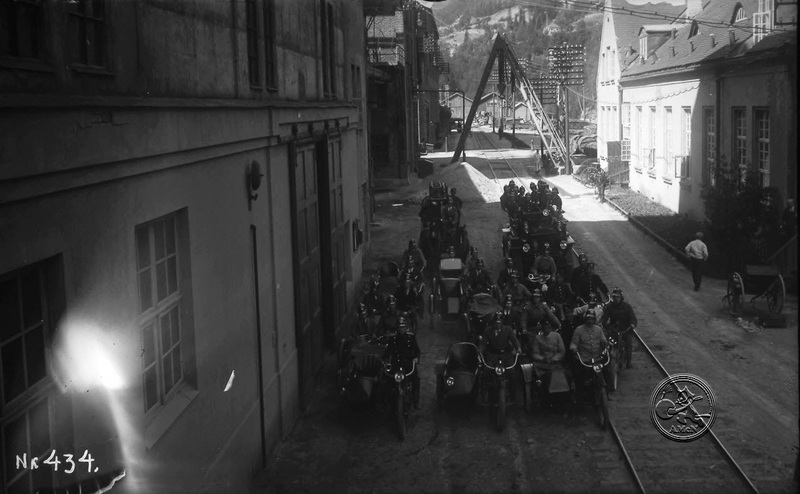 Indian motorcycles were a well-known brand in Rjukan at the time. This because many factory engineers were keen motorcycle riders, they even organized a motorcycle club in 1919 (the first club outside the capitol in Norway, Christiania). Indian was considered to hold a high quality, it was reliable and there is no doubt that the red Indian color fit the fire brigade well. The fire brigade Indians got an aluminum box mounted on the rear of the sidecar frame carrying 1oo meters of hose and hydrant connecting equipment. The sidecar also carried a modern chemical extinguisher. Each bike had a crew of three men. A third Powerplus was added in 1920 as well as a F.W.D. fire truck. Due to its modern equipment and its new fire station, Rjukan fire station was presented in Norsk Motorblads (a magazine covering the news of all motorized vehicles in Norway at the time) Christmas issue in 1921. A proud brigade leader could inform Norsk Motorblads readers that the Indians had been the first to reach the scene of fire in more than 100 occasions, this both at the factory and in the town around. Their Indians would travel at speeds up to 70 km`s at straight roads, both winter and summer. What happened to Rjukan fire brigade Indians? During the late twenties Hydro’s factory at Rjukan became less profitable and was rebuilt to produce with less energy consumption. This in turn created a bi-product, the heavy water which real name is deuterium oxide. This could become an important ingredient in Germanys attempt to create a nuclear bomb during WWII. The export of the bomb material was sabotaged by Norwegian resistance in some very daring actions in 1943 -44. In 1965 the movie "Heroes from Telemark " was filmed in Rjukan, where Kirk Douglas was the main actor. This was a film based on sabotage actions in Rjukan, among them at the heavy water factory that was placed in a steep mountainside, as an ancient castle. The film was made by the Hollywood producer Anthony Mann and the film crew was in part British. According to a story told by a Rjukan local some years ago, the Indians went with the film crew back to England after their last take. Huge interest for old motorcycles had not yet seen its light in Norway. The fire brigade Indians was supposedly still in a very good condition. This story has not yet been confirmed by other sources. 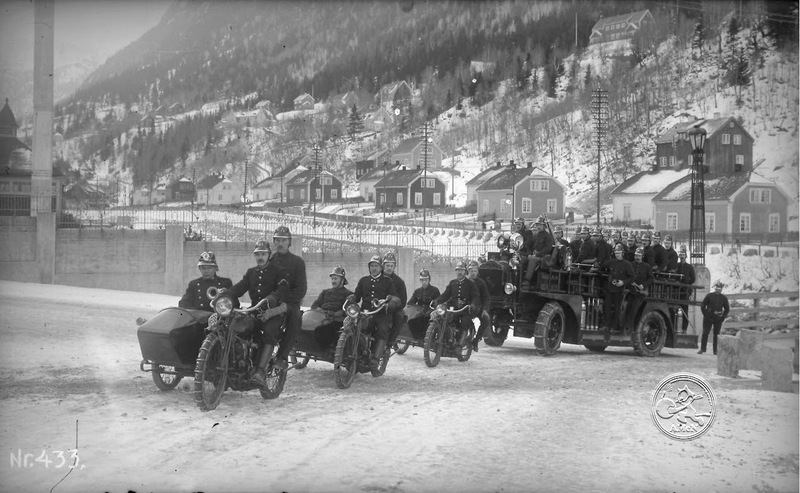 Rjukan`s motorized firebrigade. Chief Berg is seated in the front sidecar, brigade leader in sidecar two and second leader in the third. Order in the ranks! Indian H-339 from Rjukans firebrigade. 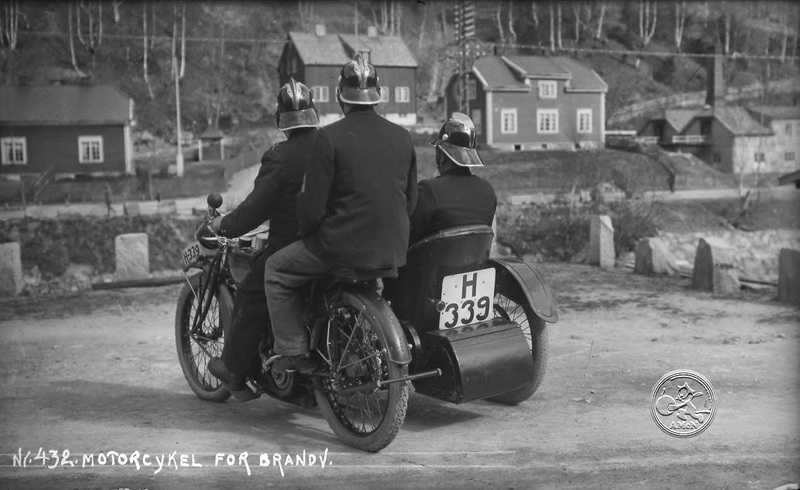 The box for fire equipment at rear of the sidecar, picture used by Norsk Motorblad 1921. Rjukan`s firebrigade on their way back from the town Rjukan to the factory. Rjukan`s firebrigade pictured inside the factory.